This will be a guide helping you get your first win, or maybe more wins and some Basic information! On Weapons & Kits. Some of these maybe wrong, but most are right. M4A1 - 30 Shots a Mag - 40 With Extended Mag. This can carry the hold all rifle Attachments + Stock. LVOAC - 30 Shots a Mag - 40 With Extended Mag. This can hold all rifle attachments - NO STOCK. AUG - 30 Shots a Mag - 42 With Extended Mag. This can hold all rifle attachments - NO STOCK. FAMAS - 30 Shots a Mag - 40 With Extended Mag. This can hold all rifle attachments - NO STOCK. MK14 - 20 Shots a Mag - 30 With Extended Mag. This can hold all Sniper attachments. Remmington 700 - 5 Shots a Mag - 10 With Extended Mag. This can hold all Sniper attachments. - NO GRIP. AK-47 - 30 Shots a Mag - 40 With Extended Mag. This can hold all rifle attachments - NO STOCK. G28 - 10 Shots a Mag - 20 With Extended Mag. This can hold all Sniper attachments. Mosin Nagant - 5 Shots a Mag - 10 With Extended Mag. This can hold an extended mag. VKS - 10 Shots a Mag - 40 With Extended Mag. this can hold an extended mag. M200 - 5 Shots a Mag - 10 With Extended Mag. This can hold all Sniper attachments. - NO GRIP. MP5 - 30 Shots a Mag - 40 With Extended Mag. This can hold all rifle attachments - NO STOCK. VECTOR - 20 Shots a Mag - 30 With Extended Mag. - This can hold all rifle attachments - NO STOCK. When choosing a Rifle i always go for M4A1, Or the LVOAC an AUG if you have a chance to get it. You can also take the AK-47 Which is a very good weapon, it's a bit harder to control than the 5.56 Weapons but it is stronger. When choosing my Secondary Weapon I'll always go with something that's got good damage and very good for close Range. I will always take a MP5 if i have to use a SMG. The MPX, Vector and MP5 are very similar. - Groza is very strong and SMG is also a good option but I prefer going with Groza because it's stronger. When choosing my Third weapon i'll always go a Sniper or DMR, the MK14 is the DMR your going to want to take UNLESS you have a extended mag for a Sniper, then you will want to take the G28 always take a Vertical Grip when using DMR's. When choosing a Sniper over a DMR you will want to take pretty much anything, i'd say the Remmington 700 is a better choice over the Mosin unless you have no x4 scope, then take the mosin, The mosin already has a scope attached and it's a x4 i think. All kits are useful in different situations. Zipline And Ice Picks have the biggest backpack and can hold 400 bulk in items. 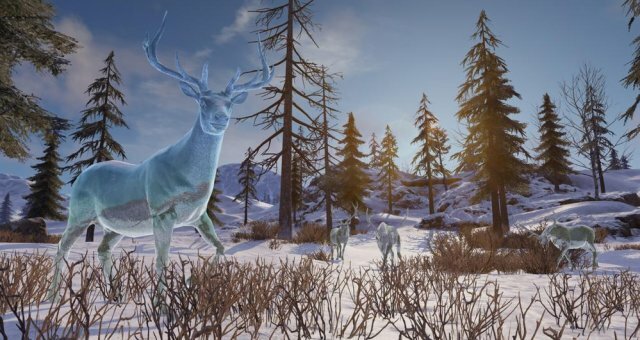 They can also move across ziplines that are placed all around the map, Ice picks are used around the map to get down mountains without taking damage. Snowboards have the second biggest backpack and hold 325 bulk in items. 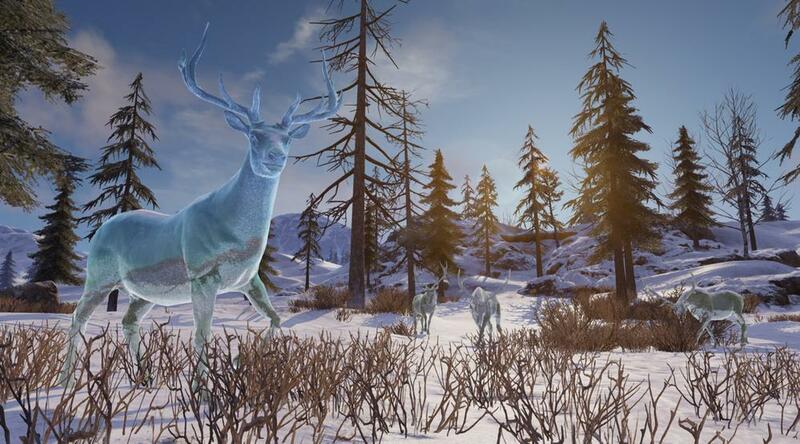 They can move pretty much anywhere around the map but only on snow. they can get there snowboard out on the roads but they don't move very fast. Gliders have the least space in there backpack and hold 250 bulk in items. They are pretty much overpowered at the moment, because of the mobility they get with the glider. They are very fast to get out and can pretty much travel anywhere if they jump from a high enough spot. The armour is very simple, There are 2 Sets you can get. Level 1 And Level 2 [Superior]. You can get some Level 2 Items just from looting them normally the same as level 1, But you can also get Level 2 Armour from Supply Drops. Level 1 is very easy to find and should easily grab a set at the beginning of the game. These are all the attachments in game at the moment. Tactical Stock - This is just a Single attachment that fits on the M4A1. 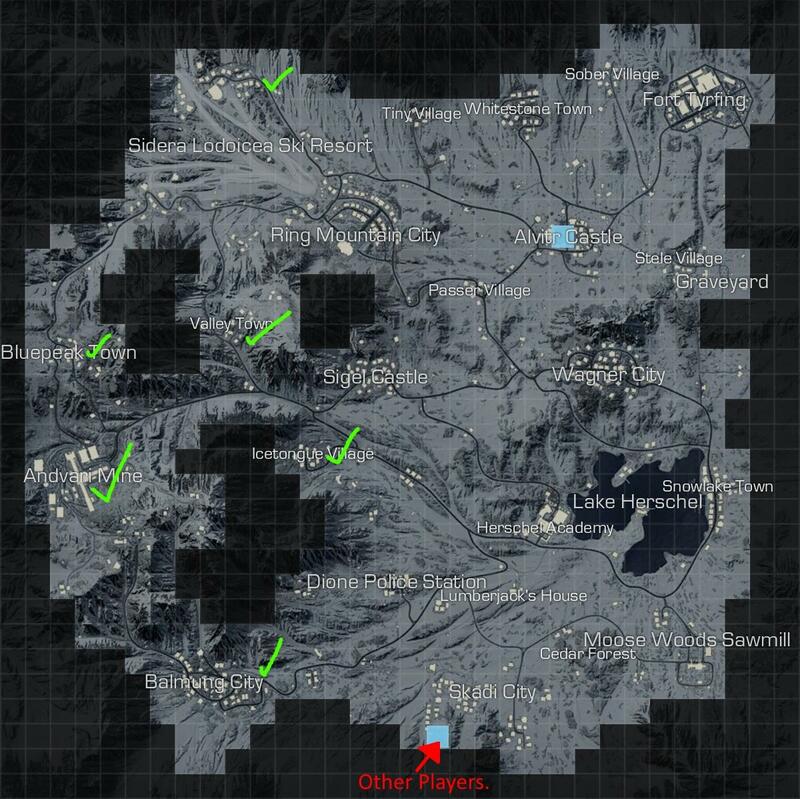 If you're looking for kills go for Sigel Castle or anywhere that has more than 3+ Blue squares. You will want to go on the outside of City's or on the side of the map, the sides of the map are high points in the game so you can get away from here after looting very fast with which ever kit you use. I've marked a few places on this map. These are my favourite places to go and are recommended.